An IndiaSpend analysis of spending on Olympics in particular, and sports in general, reveals that India spends roughly a third to a fourth of the money spent by the UK, which won 67 medals, compared to India’s two. India’s last Olympic gold medal winner, Abhinav Bindra, recently pointed to United Kingdom’s spending on athletes at the Rio Olympics, emphasising the money needed to convert performance into medals. An IndiaSpend analysis of spending on Olympics in particular, and sports in general, reveals that India spends roughly a third to a fourth of the money spent by the UK, which won 67 medals, compared to India’s two — and central funding to sports federations is falling. The UK spends money on fewer athletes compares to India, where spending is diffused among numerous federations and athletes, according to our analysis. The UK has 18 million people aged between 15 and 35, while India has more than 400 million youth in that age group. The original story in the Guardian, a UK newspaper, calculated a £5.5 million ($ 7 million) investment per medal by UK Sport, a government body that funds and manages Olympic sport. The UK, in general, spends $1.5 billion (Rs 9000 crore) on sports infrastructure and training through an annual sports budget, while UK Sport spent about $350 million on Olympics preparation over four years (2013-2017). In comparison, India spends a third of UK, or $500 million (Rs 3,200 crore) on youth affairs and sports through the Union budget and the states, according to estimates from our review of sports budgets of six large states. The same union budget funds — through the ministry of youth affairs and sports — national sports federations (NSFs) and potential Olympic athletes through the National Sports Development Fund (NSDF) and Target Olympic Podium (TOP) programme. The NSDF is also funded through private organisations and public sector enterprises, apart from government contributions. In India, Rs 750 crore was spent on sport-specific federations, training centres, coaches and other infrastructure over four years (2012-13 to 2015-16), while the spending on athletes is Rs 22.7 crore through NSDF (109 athletes) and Rs 38 crore thought the TOP programme (97 athletes for 2016 Olympics, excluding para Olympic athletes) over the last four years. The number of recognised national sports federations has come down from 57 to 49, as of 2016, and their funding has fallen over the last three years, as the following chart shows. Of the amount spent on sports infrastructure and coaching, only 8% is spent on special coaching to athletes. Of the 109 athletes supported by NSDF, only 30 made it to the official contingent of India at Rio de Janeiro in the 2016 Olympic games. Of the 97 athletes funded through the TOP programme, 68 made it to the contingent, while 29 did not. The Rs 22.7 crore ($ 3.5 million) spent for by NSDF on potential 109 Olympic athletes translates to Rs 5.2 lakh, or $9000, per athlete every year in the run-up to Olympics. Athletes under the TOP scheme received Rs 9.8 lakh, or $16,000, per athlete every year, including the cost of training centres and coaching fees. The UK, which finished third on the Rio medals tally, spent $350 million on 374 athletes, which is about $1 million per athlete, including infrastructure, training and coaching. Specific spending on medal-winning athletes went up to $36,000 a year, four times the $9000 that India spent on its athletes. 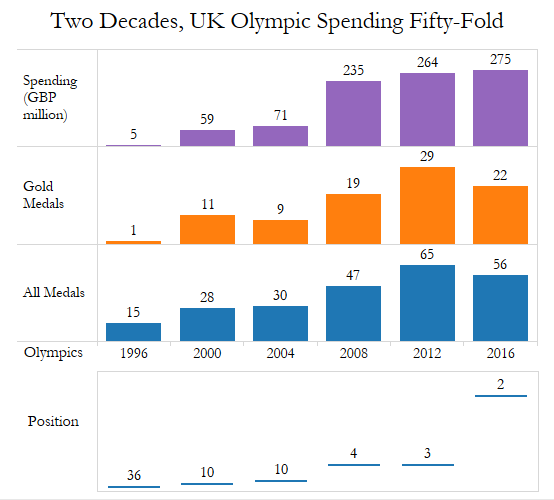 The UK started specific or targeted spending only after 1997, in the run up to the 2000 games. There appears to be a direct correlation between money spent by the UK and Olympic medals won. With a funding of 5 million pounds for the Atlanta Olympics, where it won a single gold medal and finished 36th, the UK finished second at Rio, its best after a century (it was first in 1908) with 27 gold medals. The UK stood second in the gold medals tally, while India won one bronze and one silver medal at Rio Olympics 2016, and stood 67th. The US does it differently -- many athletes raise their own money. Athletes from the US depend largely on private funding. More than 100 US athletes started individual funding portals for donations from the general public. Only 10% of the US Olympic committee’s finances are actually spent on athletes, notes a Guardian report. The US topped the Rio medals tally. China, which came third at Rio, is known for aggressive state-sponsored promotion of sports. After a decade of effort, China — for the first time — topped the medals tally at Beijing 2008. Recently, the Chinese government has called for a review of its medal-focused approach to the Olympics, arguing that it undermines the spirit of sports. While the role of private funding to the Games as sponsorships and contributions to NSDF is open and documented, the funding to individual athletes is not. Recently, India Infrastructure Finance Company Limited, a public-sector company, contributed Rs 30 crore to the NSDF for three years. The Indian Olympic Association (IOA) received donations from Reliance Jio, Edelweiss Financial Services, Amul, Tata Salt, Herbalife and Li Ning and SBJ. India’s first medal winner in Rio Sakshi Malik thanked JSW Sport, a foundation funded by the OP Jindal group, a conglomerate with interests that include mining and power. Indian badminton player Saina Nehwal’s Hong Kong trip in 2010 — where she won the Hong Kong super series and rose to World No. 2 — was funded by Olympic Gold Quest, a foundation created and supported by former sports persons. The sports ministry spent Rs 1500 crore on organizing the 2010 Commonwealth Games, taking the sports ministry budget to an unprecedented Rs 3000 crore, but has not shown a similar inclination to fund sportspersons, IndiaSpend reported in 2014. The National Sports Development Fund, we noted, does not use its money effectively. The story was first published by IndiaSpend.